The palms of our hands "hold stories of our lives" has long been considered true, which is why so many seek out palm readers for a glimpse at what's in store for them. If you look at your palms you'll notice zillions of lines and marks and bumps, each representing something. Authors Robin Gile and Lisa Lenard say, "The hand reflects precisely what it is that makes you unique", and "So can you change the future? Yes, you can. It's in your hands". Most of us have heard about having a heart line or a life line, but not everyone knows how to interpret these lines, so, by giving yourself a better understanding of the layout of your hand, you will be able to decipher your own emotions, talents, health, and more. It's not just a quick look at a palm and that's that. There are lines, bumps, widths, fingers, circles, triangles, and so much more to be considered. There are excellent diagrams throughout the book which help when defining a certain aspect of the palm or fingers. With the help of this book, the way you look at the hands of friends or partners or lovers, may change greatly. Hopefully for the better. Your own hands may reveal things you never knew about yourself - your strengths and weaknesses, creativity, leadership, romanticism, ambition, love, relationships, and more. You are shown how to read your palm with a clear understanding of all those lines, crosses, stars, etc. Hands change over time, as we all do, so do our fortunes. 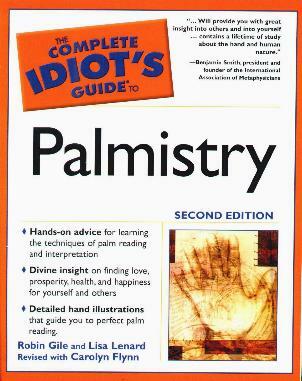 I'd love my palm to be read by a professional as I've always found palmistry rather fascinating. Be sure you have yours read by someone who truly knows their craft. Conclusion - Extremely informative and something quite different.